This Spring has been so so busy! I've taken two vacations and showcased my bags at three major shows. Finding time to actually sit down and sew, then photograph, edit and post new bags to my Etsy shop can be kinda difficult! However, I am so happy I made some new bags last week, and got them all ready to post today. It's been a long time since I have made new Mirella bags - and I hope to sell them all very soon. Mirella is one of my "trademark" designs. I've sold lots of them at Parts & Labour and at various shows. I developed the pattern back in 2003 - after playing with a cool vintage napkin and pleating techniques. The coolest part is that Mirella is reversible! Check out two of my latest creations, and don't forget that I post new items in my Etsy shop every Tuesday and Thursday! Last week I had the pleasure of meeting Josh Harvey, part owner of the Storyville boutique on the UT Austin Campus. I am working to get my products in more stores, which is hard for a gal like me - because I would always rather be creating than selling! Josh and his siblings (11 total!) founded this unique shop in their native Louisiana. They set out to create a store that featured apparel and accessories from local and college student designers. "Storyville’s mission is to celebrate local artists and designers and to encourage individual expression. That’s why our shops feature tees, bags, wallets, bracelets, kids/baby clothes, dolls, etc designed by local artists. And that’s why we make one-of-a-kind, customized t-shirts." Launched in 2007, the Storyville mini-chain has locations at LSU and UT - you gotta love College Campus Stores! I went to UT from - ahem, revealing my age here - 1997 to 2002. The printed t-shirt has definitely picked up steam as the uniform of college kids since then. I remember still trying to be a little fashionista in school and wearing dresses and high heels most of my freshman year. What can I say, I like to get all dolled up. Storyville also has a website where you can buy many of their tees. I LOVE all the pictures of students - especially because you can tell they are real people - not anorexic model types. To start - Storyville is carrying some of my Mini Wallets and Wristlets - very big sellers that should appeal to the college crowd. 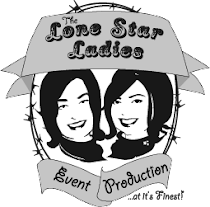 I am excited about our new partnership, and hope you get a chance to check out their shop! BTW - you can drop into Storyville and design your own tee for only $25! Sweet! 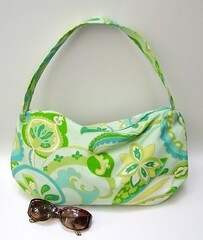 Anne Marie is Teaching Bag Making Classes!!! For years now, people have been asking me if I teach sewing classes, and the answer has always been no. Starting next month, the answer is YES! Last fall I decided that I wanted to release a line of sewing patterns. Designing bags is my favorite thing to do, and to date I have over 90 original patterns under my belt. I can't think of a better way to share my love of making bags than by teaching others how to make them. Each month I will release a new pattern and accompanying class. The patterns will be "homegrown" until I can get all that fancy software to publish them like a rock star. My first pattern is my Erin Hobo Bag. I developed this pattern a few years ago, and have made and sold hundreds of them. 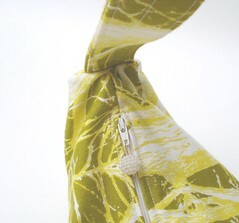 Almost all commercial patterns with a zipper closure instruct you to attach the lining by hand sewing - "yeah, right!" - is what I said to that! I based the zipper technique off of a pattern I found from 1945, and modified the shape and construction to be a modern bag. 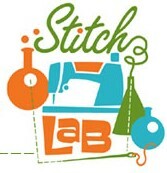 The Stitching Studio in North Austin is owned by my good friend Ann Randall. A few years back, Ann responded to a post I made about needing an assistant. She faithfully worked for me for one year, and blew me away with her awesome attitude and fast sewing abilities. One day she announced her desire to quit her job and open her own Sewing Studio - and I couldn't have been happier! Ann has been a key player in making my pattern and teaching dreams come true - she lets me experiment teach on her friends!!! ...and don't forget to check out the new goodies in my etsy shop! I just wanted to share a very cute Texas moment. Last week I went to get my hair cut at the Beauty School with my sister. Yes - I pay only $5 for a haircut (ahem - artist budget!) plus tip, and I always get a good cut. The local Beauty School is a great place to observe hairstyles past in full swing. You see, women from my Grandmother's generation got, and still get, their hair set once a week. In fact, my Grandmother says she hasn't done her hair in... well, maybe never! As I sat in the chair to discuss my haircut, I noticed the woman next to me. She looked very sprightly, perhaps in her 70s. She was wearing Burnt Orange Crocs with a Longhorn logo (HOOK 'EM HORNS!) and a Longhorn watch. Her stylist asked to see the picture she had brought of the hairstyle she wanted. The older woman rummaged through her canvas tote bag and pulled out - gasp - a magazine cover with none other than Lady Bird Johnson sitting in a field of wildflowers. Considering that it is prime wildflower season here in Texas, and that Mrs. Johnson passed just last year - I was touched and smiled to myself. I couldn't help but think how wonderful a role model she is, and perhaps I would like to get my hair styled like hers one day. It's not like you hear of many women asking to get their hair styled like Hillary, now is it? For now, just a simple photoblog of items I LOVED at Roundtop. 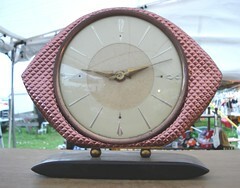 I bought lots of vintage linens, buttons, a few pottery pieces and a few kitchen pieces. Ohhh time to start saving up for next time! Lots of my pictures feature circular items - apparently I am drawn to circles this year! 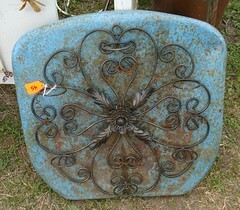 Hand crafted metal decor from salvaged chair and iron work! 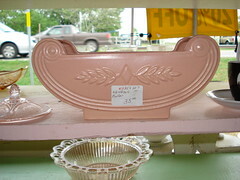 Pink Planter with cool deco styling and circular edge shape. 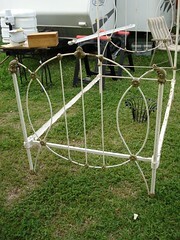 Metal bed frame with circular design - I love these beds! 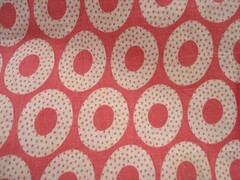 Feedsack fabric in my FAVORITE color - coral - with sweet circle and dot pattern! 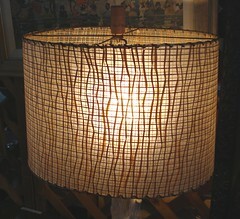 Uber cool lampshade - I loved the texture of the fibers and the way it softened the light. Funky 60s or 70s lamp - so over the top! Atomic Clock - 50s or 60s - too bad it wasn't working or I would've bought it! A shockingly green pottery vase - the dealer said it was very rare - I just loved the shape and color and the CIRCLES! My favorite for last... a super cool clutch purse from - hmm - late 40s or early 50s. I am SO INSPIRED by this bag! 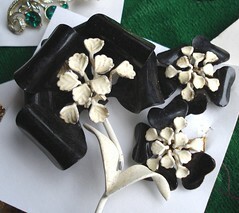 I hope you enjoyed the pretty treasures of this year's trip! Back soon with more pics and info!